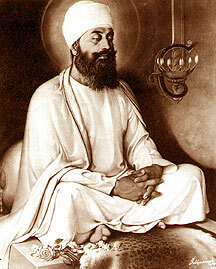 The ninth Guru, Sri Guru Tegh Bahadur Ji, was born in 1621 in Amritsar. He became Guru in 1664. He established the town of Anandpur. The Guru laid down his life for the protection of Hindus, their Tilak (devotional mark painted on the forehead) and their sacred thread. He was a firm believer in the right of people to the freedom of worship. It was for this cause that he faced martyrdom for the defense of the down-trodden Hindus. So pathetic was the torture of Guru Tegh Bahadur that his body had to be cremated clandestinely at Delhi while his head was taken four hundred kilometers away to Anandpur Sahib for cremation. Guru Tegh Bahadur Ji's supreme sacrifice. Since you have plugged the free flow of Guru's grace, . . . there will be unpleasantness and heart burning at every step." - These words of Guru Amar Das to his daughter Bibi Bhani when she sought to retain the Guruship for her family proved prophetic again and again. But they were never so true as in the case of Guru Tegh Bahadur's succession. Then word went around that the successor to Guru Harkrishan was at Baba Bakala it is said that as many as twenty-two aspirants from amongst the Sodhi dynasty styled themselves as Guru and started receiving offerings from the Sikhs. The devotees coming to Baba Bakala were bewildered. A prosperous trader, Bhai Makhan Shah, met the same fate. He was told the tragic news of Guru Harkrishan's passing away and informed that his successor, the ninth Sikh Guru was in Baba Bakala. Bhai Makhan Shah hurried to Baba Bakaia to pay his homage to the living master and make his promised offering. When he reached Baba Bakala, he was perplexed to find a true living Guru at almost every step claiming offerings from the confused pilgrims. A shrewd businessman, Bhai Makhan Shah decided that rather than part with the entire amount of five hundred gold mohurs he would make an offering of two mohurs to each one of the twenty-two self-styled gurus. After he had gone around the town satisfying each one with the uniform offering of two mohurs a child told Bhai Makhan Shah that there was yet another holy man staying in a house across the street. Bhai Makhan Shah decided to visit the house pointed out to him. Guru Tegh Bahadur was busy with his prayers when Bhai Makhan Shah arrived. His people were aware that he didn't much relish meeting visitors. They would have driven Bhai Makhan Shah away but for the Guru's intervention. The Guru thought that if he did not help Bhai Makhan Shah, a devout Sikh, to identify him, he would be misled like many others and the confusion prevailing amongst the Sikhs would continue to be confounded. Bhai Makhan Shah came to Guru Tegh Bahadur, and as he had with others, made an offering of two mohurs. The Guru smiled. Bhai Makhan Shah suddenly felt uneasy. It was the discomfiture of one who owed someone a debt. Realizing the devotee's embarrassment, Guru Tegh Bahadur said, "I thought you had pledged five hundred mohurs." At this Bhai Makhan Shah's delight knew no bounds. He clung to the Guru's feet. He kissed them again and again. In a mad frenzy, he rushed to the roof of the house and started shouting, "I have found, I have found the True Guru." The Sikhs all over the town heard it and hurried to the house of the quiet saint called Baba Tegha. They greeted him with the slogan, "Long live the Ninth Guru!" In the meanwhile, Bhai Makhan Shah brought his bag of five hundred mohours and made his promised offering. There were great rejoicings and celebrations at the identification of the Ninth Successor to Guru Nanak. Dhir Mal, the eldest son of Bhai Gurditta, was most unhappy. He entered into a conspiracy with a masand called Sihan and raided the Guru's house. It is said that they shot at Guru Tegh Bahadur, wounding him in the arm, and then fled with everything worth looting in the house. Luckily Bhai Makhan Shah was still in the town. He rushed to the Guru's residence and found that Dhir Mal's men had already fled with the booty. He chased them and brought them, with hands and feet bound, for punishment. He also had all the looted property restored to the Guru. But the Guru would have none of it. He returned it to Dhir Mal, telling Makhan Shah innocently that it belonged to him. Dhir Mal heard it, and he was put to utter shame. Guru Tegh Bahadur now decided to leave Baba Bakala and move to Amritsar. Throughout his journey the devotees lined his route to greet him. But when the Guru arrived at Amritsar, the masands shut the doors of the sanctorum and would not allow him to enter. At this, an old lady called Hariyan, belonging to a village close by, invited the Guru to spend the night in her humble house. When the womenfolk in Amritsar heard about it, they led the true Guru in a big procession, chanting hymns. Guru Tegh Bhadur's destination was Kiratpur. But he didn't find the atmosphere at Kiratpur too congenial either. The Guru therefore acquired a large enough tract of land from the Raja of Kahlur and founded a new town called Anandpur, about six kilometers from Kiratpur. The Sikhs came from far and near to settle in the new town. But before the town was fully developed, the Guru had a call from the east. Stage by stage, camping at various places, the Guru arrived in Delhi, where he was received with great enthusiasm by the Sikhs, including the wives of Raja Jai Singh and Kanwar Ram Singh. Raja Ram Singh was under house arrest and Raja Jai Singh was away. Wherever he halted in the Punjab during his journey to Delhi, the Guru had wells sunk, tanks dug, and free kitchens established. From Delhi he went to Patna via Allahabad. Since his wife was expecting, the Guru left his family at Patna and proceeded to Assam. During the Guru's visit to Assam, Aurangzeb deputed Raja Ram Singh with a large force of thirty thousand infantry, eighteen thousand cavalry, and fifteen thousand archers to fight the Raja of Kamrup, who had captured Guwahati. Since Raja Ram Singh was a Sikh devotee, he approached the Guru for his blessings. Situated in this unenviable position, Raja Ram Singh sought Guru Tegh Bahadur's good offices to negotiate a settlement with the Ahom King who, evidently, had great respect for the Guru. The Guru conducted the negotiations successfully. Guru Tegh Bahadur had penetrated into Assam as far as Guru Nanak had done accompanied by Mardana, the Rabab player during his pilgrimage of the holy shrines in the east. After a few years' stay at Patna, the Guru decided to return to the Punjab. He left his family behind, however, his son Gobind Rai was still young, the conditions in the Punjab continued to be uncertain and unsettled. The Guru was accompanied by Bhai Mati Das and a band of his bodyguards. Before long, the Guru sent word to Patna, suggesting that his family join him at Anandpur. The conditions in the Punjab and the rest of the country were deteriorating day by day. Though said to be a God-fearing and pious" person, Aurangzeb honestly believed that Hinduism was utterly misconceived, decadent, and corrupt. Another factor that contributed to Aurangzeb's ill-conceived adventure was his anxiety to improve his image. He had imprisoned his own father and starved him to death. He had his brothers Dara Shikoh and Murad murdered. He grievously insulted his son Muazzim, who later on ascended the throne as Bahadur Shah. The Islamic world thought poorly of him. He started trying all conceivable means to achieve his objective. Where economic sanctions failed, he tried to lure people with jagirs and jobs. He fostered disunity and ill-will amongst the various castes and classes of Hindus. If this did not work, he threatened non-Muslims with dire consequences. He issued instructions to his governors to launch a mass conversion drive of Hindus and ensure that not one Hindu was left in his kingdom. It is said that the sacred threads of the Hindus converted to Islam by Sher Afghan, the Governor of Kashmir, weighed a maund and a quarter. It wag by design the Aurangzeb ordered mass conversions to start from Kashmir Kashmiri brahmins were known to be most orthodox and also highly erudite. The more important consideration was that Kashmir had the tribals of Kabul and Kandahar next door. If the Hindus of Kashmir misbehaved, a jehad could be raised and non-believers subdued with the sword. Before long, the Governor of Kashmir realized that the Hindus had started fleeing his province. He therefore invited the leading brahmins of the community for a dialogue. He explained to them his helplessness in view of the firm orders from Delhi. They were either to accept Islam or face the consequences of noncompliance with Imperial orders. Time flew sooner than they had imagined. At last the Kashmir brahmins decided to make a pilgrimage to Amamath and seek intervention of the deity. It is said that while at the Amamath temple a member of the group of worshippers, Pandit Kirpa Ram, dreamed that they could be protected only by Guru Tegh Bahadur, the ninth in succession to Guru ( Nanak, who was the saviour in Kaliyuga.). Immediately they left for the Punjab under the leadership of Pandit Kirpa Ram, and reached Anandpur via Amritsar. He advised the visiting supplicants to go back and inform their tormentors that they would be willing to accept Islam if Guru Tegh Bahadur could first be persuaded to do so. What could be easier than this? The King ordered the arrest of Guru Tegh Bahadur and had him brought to Delhi. The fact of the matter is, that after giving assurance to the Brahmins of Kashmir, the Guru himself undertook the journey to Delhi, along with a few of his close followers. Among them were Bhai Mali Das, Bhai Dyala, and Bhai Sati Das. 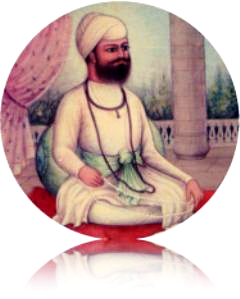 Before leaving Anandpur, the Gum ordained thirteen-year-old Gobind Rai as the next Guru. The Guru, along with his aides, was arrested at Ropar and taken to Delhi. There were temptations offered as well as threats of torture and death. The Mughal Emperor offered another alternative to the Guru." If you are a man . of God, you must work a miracle," he said. The Guru would not purchase his release the way a juggler earns his living. Then the inevitable happened. The Qazi gave his fatwa. Jalaluddin, the executioner, sharpened his sword. Word went around the whole town and on the afternoon of 11 November 1675, the Guru was beheaded in the presence of thousands of people. It is said that the execution was followed immediately by a sandstorm, the like of which Delhi had never known before. Under cover of a blinding storm Bhai Jaita picked up the Guru's sacred head and dashed to Anandpur Sahib. Then Bhai Lakhi Shah, a Government contractor who had access to the Kotwali, picked up the remaining part of the Guru's body and, putting it in his cart loaded with sundry goods, rushed out of the town. Reaching the present site of Gurudwara Rakab Ganj, he set his house on fire along with the Guru's holy body. He broke his potsherd on the Delhi King's head And he left for paradise.None else in this world can match Tegh Bahadur's sacrifice.The people mourned Tegh Bahadur's passing away.There was wailing in the world but rejoicing in heaven. It was a strange irony of history. Two hundred years before, Guru Nanak, at the age of nine, had rejected the sacred thread and admonished the Brahmins who insisted on his wearing it. And now when he was thirteen years old, the tenth Guru suggested that his own father should go and give his life so that the right of a community to wear the sacred thread and practice its faith was protected. This makes Guru Tegh Bahadur's martyrdom unique in history. The supreme sacrifice made by Guru Tegh Bahadur stemmed the tide of intolerance in the sub-continent and inculcated in people respect for other religions. Guru Tegh Bahadur was essentially a peace-loving soul. He would rather submit to aggression than resist it. But he would never compromise on principles. It was extremely easy for him to Work a miracle and save his life but he didn't budge from his conviction that miracle-making was, at best, gimmickry and it did not become men of God to indulge in such-activities. Guru Tegh Bahadur was a poet of keen perception. His slokas continue to be popular generation after generation, and they are a great solace to people in grief and sorrow. His greatest contribution, however, is the way he groomed his son for the fearful struggle ahead. Pandit Kripa Ram was later baptised by Guru Gobind Singh, and he gave his life heroically fighting the treacherous Mughal forces at Chamkaur along with Guru Gobind Singh's two elder sons. However, it is not as though Guru Tegh Bahadur had never known fighting. In his youth, when the Mughal forces attacked Kartarpur, he had sought permission from his father, Guru Hargobind, and given a fearless fight to the invading forces. Death is a certainty, one must not set one's heart on this world. It is God who sends pleasure and pain, profit and loss, weal and woe; these must be accepted as the will of God. One must do one's duty arid meditate on God, under true Guru's benign guidelines and graceful blessings.